The Canon VIXIA HF S11 Dual Flash Memory Camcorder features a 64GB internal flash memory and SDHC memory card slot for over 24 hours of video capture. 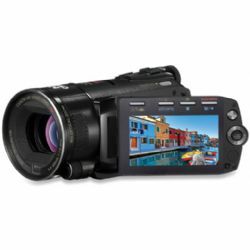 In addition to recording full 1920 x 1080 high definition AVCHD video with a bit rate of 24Mbps, the camcorder also takes 8MP digital stills and offers a wide variety of shooting functions and features, including Dual Shot, Face Detection, and a built-in flash. Video or still, the HF S11 records both with its 1/2.6" 8.59MP HD CMOS sensor and gets an added boost from the DIGIC DV III Image Processor, Dynamic SuperRange Optical Image Stabilization, and other Canon specific features. Enhancing your movie making abilities would be the camera's 24p Cinema Mode and the 30p Progressive Mode. Colors and exposure will have a richer film-look that will give your video more visual punch and depth. Other ways in which Canon gave the HF S11 more versatility include the ability to add external microphones and lights using the mini Advanced Accessory Shoe and the option to use headphones to monitor audio while recording or upon playback. If you're looking for a camcorder that provides you with HD recording, generous storage options, the ability to add external lights and mics, and a bevy of other useful functions, the HF S11 has it all and more.